Whole food, raw superfood made from all natural berries - Mix with milk or juice for a complete meal shake, or use as a health supplement. 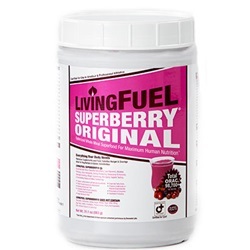 Living Fuel SuperBerry® has the same concentrated sources of vitamins, minerals, proteins, essential fats, enzymes, co-enzymes, herbs, botanical extracts, and soluble plant fibers as the Living Fuel SuperGreens. But instead of greens, each serving of this super-food meal replacement contains over 120 g of whole organic berries, including blueberries, strawberries, raspberries, and cranberries. These powerhouse fruits are high in fiber, taste great, and are densely packed with antioxidants, phytochemicals and flavonoids. Berries are also high in Vitamin C, which supports the immune system, neutralizes pollutants and is vital in the production of collagen, essential for joint and skin health. Each container of this raw, whole food powder contains 12 complete meals. 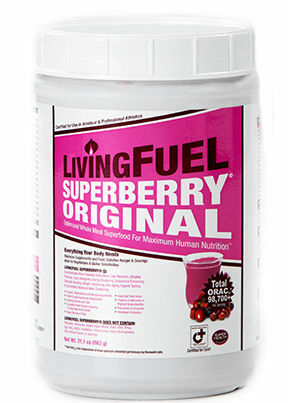 For those who use SuperBerry® as a supplement, there can be up to 48 servings per container. As a complete and balanced meal: Add 1 serving (2 scoops) in a 20+ oz container or blender, and mix with 16-18 oz or more of purified spring water until desired texture if achieved. Use blender, hand mixer, or shaker to mix until smooth. Optional: Mix one scoop of LF Rx Super Berry with one scoop of LF Rx Super Greens. Add a splash of your favorite fruit juice. Add 1/3 to '½ of a banana or your favorite fruit. Add virgin coconut oil, Cocochia or finely desiccated coconut. As a food supplement: Use '¼ serving (1/2 scoop) or more and proportionately follow directions for a complete meal. For children: As with any food, use proportionately less based on age, weight, appetite and size.